The first collection of Kipling's classic tales. Includes "Mowgli's Brothers", "Hunting-Song of the Seeonee Pack", "Kaa's Hunting", "Road-Song of the Bandar-Log", "Tiger! Tiger! 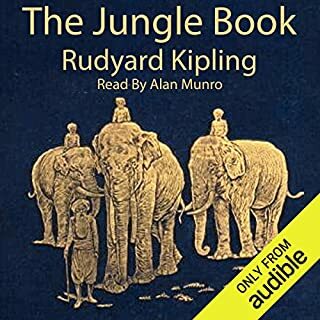 ", "Mowgli's Song", "The White Seal", "Lukannon", "Rikki-Tikki-Tavi", "Darzee's Chant", "Toomai of the Elephants", "Shiv and the Grasshopper", "Her Majesty's Servants", and "Parade Song of the Camp Animals". the tone, the pitch, EVERYTHING about Alan Munro's voice is wrong. Neither I nor my daughter could understand a thing. i want my money back!